France acknowledged Thursday that it instigated a "system" that facilitated torture during Algeria's independence war, a landmark admission about a conflict that remains hugely sensitive six decades on. Emmanuel Macron -- the first president born after the conflict -- went further than any of his predecessors in recognising the scale of abuses by French troops during the 1954-62 war. Visiting Audin's widow, Macron also announced that France would open up its archives on the thousands of civilians and soldiers who went missing during the war, both French and Algerian. But he replied: "It's for me to ask your forgiveness, so don't say anything." In a statement, the presidency said the special powers given to the army to restore order in Algeria "laid the ground for some terrible acts, including torture". During the bloody war, which claimed some 1.5 million Algerian lives and ended 130 years of colonial rule, French forces cracked down on independence fighters and sympathisers, with a French general later admitting to the use of torture. But on Thursday, the government declared, "There can be no liberty, equality and fraternity without the search for truth." In 1998, Jacques Chirac acknowledged the massacre of civilians in the town of Setif in 1945, and in 2012 Francois Hollande recognised the "suffering" caused by the colonisation. "Beyond the symbolic case of Maurice Audin there is a much bigger and important gesture," he told AFP, calling it a "milestone". But he stressed that what Macron had announced was "a policy of recognition, not of repentance". "It's not about beating ourselves up about it, it's about recognising what took place." 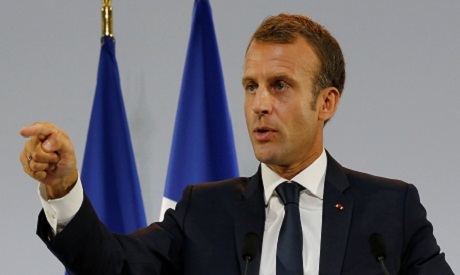 Macron had sparked controversy on the campaign trail last year by declaring that France's colonisation of Algeria was a "crime against humanity". He later walked back the comments, calling for "neither denial nor repentance" over France's colonial history and adding: "We cannot remain trapped in the past". "What is the point of the president opening old wounds by bringing up the Maurice Audin case?" asked its leader Marine Le Pen, whose ex-paratrooper father Jean-Marie -- the party's founder -- served in the war. Algeria's Minister for Ex-Combattants Tayeb Zitouni, by contrast, called Macron's remarks "a positive step". Audin's disappearance had long been a source of speculation in France. "I never thought this day would come," his widow Josette told reporters before Macron's arrival at her home. This remained the official version of events until 2014, when Macron's predecessor Francois Hollande acknowledged that Audin died in detention.